The Worst Way to Pick a Mutual Fund is Often the Most Popular. It’s all in a name. Until, well, it’s not. 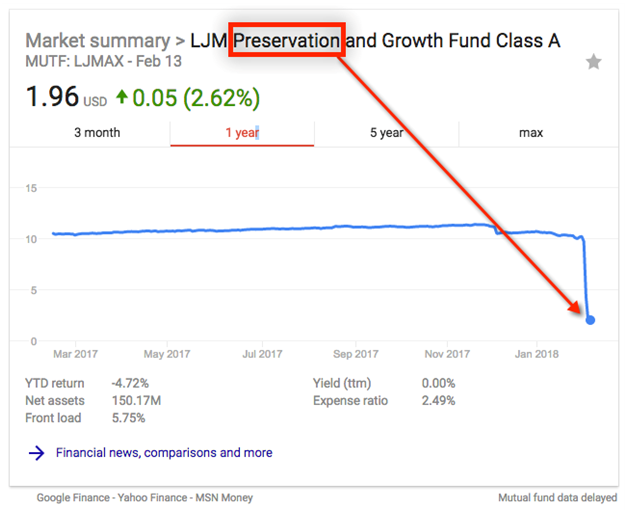 The $772 million LJM Preservation and Growth Fund’s share price plummeted from $9.67 to $4.27—a 55.8% decline. To make matters worse, the fund (ticker: LJMAX) didn’t report the loss until late the following day, so shareholders were in the dark as to what had happened. The fund then suffered another 54.6% fall, to $1.94 a share on Feb. 6—for a two-day total decline of 80%. This is probably the largest two-day loss for a mutual fund…ever. How does something like this happen? Well, for starters, it appears that the fund sold naked put options on S&P 500 futures, and it was way over-leveraged. In all fairness, many investors might not even understand what that means (“naked put options” are contracts that give the buyer the right but not the obligation to sell (put) shares at a particular price and future date. Since a “naked” writer does not hold a position in the underlying security represented in the options contract, the investor is exposed to more risk, according to Investopedia.com).Plus, in this case, this approach was not transparently disclosed. Investors do understand one thing: preservation. The reason this fund had “preservation” in the fund name was for one reason: marketing. Investors often make their fund selections by name alone. This fund was marketed as a capital preservation tool. Educated investors know to look at a fund’s performance over its title; obviously selecting a fund by name only can be a dangerous strategy. At The Retirement Planning Group, we look “under the hood” of all the funds we recommend to our clients. While every fund has a specific name to help investors gauge its strategy, wise advisors use their tools and knowledge to dig deeper. Sometimes we find the fund has the latitude to invest in other areas. Knowing about these “other areas” helps keep investors out of trouble. Merely selecting a fund by its name can have disastrous consequences. As an investor, you scrimp, save and sacrifice to amass the money to invest. Be sure you’re doing exhaustive research on all the funds you invest in. If not, be sure you’re working with an advisor who does. Kevin was raised in Missouri and graduated from Missouri State University with a major in Risk Management and Insurance. He is a CFA® charter holder and a member of the CFA Society of Kansas City. Before joining the firm, Kevin spent 12 years in various financial services roles, specializing in investment management and advice. This entry was posted in Blog by Kevin Jaegers. Bookmark the permalink.